Why is an awareness of one’s digital presence important? Your digital presence is extremely important it’s how family, friends, colleagues, employees, and the world, gets to know who you are. Your digital presence shows what you do online, such as searches, social media posts, shopping, and so on. Unfortunately your digital footprint is very hard to erase. So it is critical you leave a positive digital footprint for your future. Also, make sure you always check your privacy settings and make sure you approve other posts from friends before the post goes viral. You don’t want to compromise your reputation because of what someone did. What is your personal digital presence saying about you? It is very frightening to see what pops up when you Google yourself. The web stores and keeps everything that you have ever put on the internet, such as posts, pictures, emails, shopping sites, account information, and the lists go on and on. My personal digital presence showed my Facebook, Twitter, and Instagram account. I was reminded I set up a LinkedIn account, which I should update and use. Pictures of myself came up that I have on social media sites as well as other people with the same name. I was surprised to see when I googled my maiden name, my married last name came up with the city I live in and school I attend. That’s a scary that so much information is out there when you google just a name. As a future teacher, what role will digital citizenship and your digital presence play in your professional life? Teachers need to be an example to their students. 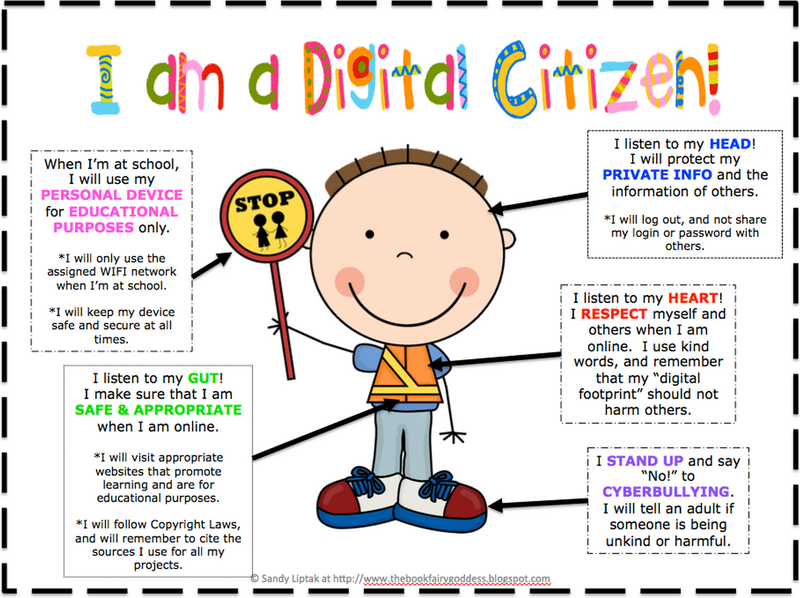 If you are teaching digital citizenship to your students your “digital past” must show what you are teaching. As a future educator your digital presence should reflect you in a positive light. It should be professional and respectful. Don’t post things you wouldn’t want said about you! Always THINK before you speak! Your response as to why one’s awareness of their digital presence is important is extremely accurate.Digital presence does show everything that you do online, especially trough social media networks. Everyone online is able to look up who you are, which is a scary thought; this is why it is important to check the privacy settings on your accounts, just as you mentioned in your blog. I also like how you put the the acronyms for THINK. Everyone needs to be aware what they are posting up on the web, and remembering these simple words can go a long way. The graphic you link to, ‘Manners Matter. Be a Better Digital Citizen’ is awesome. The dos and don’ts are both good reminders that digital behavior matters, and that the Internet can be a very small place. My favorite ‘do’ is to treat others the way we’d like to be treated. My favorite ‘don’t’ is don’t feed the trolls. It’s hard to believe there are people out there preying on others, just waiting to make a bad situation worse. This document truly is a code of online behavior that can be a manifesto for students as they venture out into the world wide web. You’re right about ensuring that your digital presence is all positive and secure. I also enjoyed your link to the Youtube video which was direct and entertaining. Being a teacher will impact what you do and who you associate with. For example, if you have family or friends on your social media, your students can find you through their accounts if their settings are public. There’s not much privacy online, but we need to utilize the security tools that are available. On the other hand, you can run a background check on other people if you want to find out more about them. For example, before renting to a roommate, dating, and hiring someone. I completely agree to think before you post,and it is true what you said that what you say is a reflection on you. I am a firm believer of leading by example that is a rule that should always be followed especially as an educator. I also find it very scary to see how much information is out there if you Google yourself. That is why it is so important to think before you post anything, you never know what will come back and hunt you. I really love your posts, they are very insightful!! I like the THINK example it is perfect for this discussion, unfortunately many people do not think before they speak and they find themslef in a bind. As educators we hold a responsibility to lead by example. How are we suppose to expect our children and students to listen to what we have to say if we do not honor our own requests. We must be the examlple we expect of our students.